 Public Lab: Can anyone tell what is wrong with my coqui? Question: Can anyone tell what is wrong with my coqui? Hmm, it looks perfect compared to the one at #coqui. Is the little dot/depression on the black chip in the upper left position? Is it possible it's flipped? It's really hard to see, I wish the component we're better labeled. The black dot is in the right place. I've experienced this before, and generally it's resolved when I went through and double checked and repositioned the wires-- it could be that something somewhere isn't pushed down as far as it needs to be (there are metal strips under the holes, and it's possible if the wire is a little bent or not quite pressed in it miss making the connection). Oh hey, what about voltage? 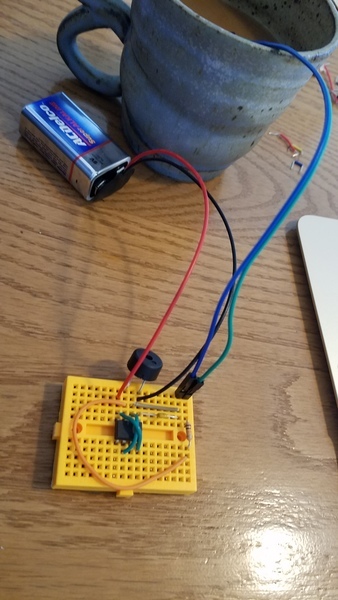 I just remembered that we were using 2-AA batteries which would only be 3V and you are using a 9V. Can the chip handle that @warren? I remember only using 9V for the big speaker setup. Oh interesting. This is the only way I have to hook up a battery right now. Switched out the wires into the (yes Haha) coffee, still not working. I'm thinking you're right on a battery issue. 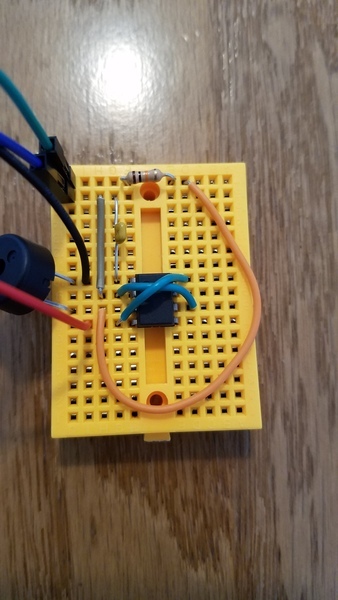 I'm still learning about how to know whether circuits can handle voltage, but so far it looks like the 555 timer probably is fine, but not sure about the piezo buzzer. Need another engineer type to weigh in. Wow so weird! Sometimes the legs can get bent on those--anyway, so glad it's working. You should post a video so we can hear the sound of the coffee! Ah ha! Glad it's working out. We'll make a note that the timer might be the issue if you're getting noise, but not the RIGHT noise. In retrospect it makes sense that the timer would be a likely culprit. Good catch! Yeah, it works fine, it's a bit louder which is nice.